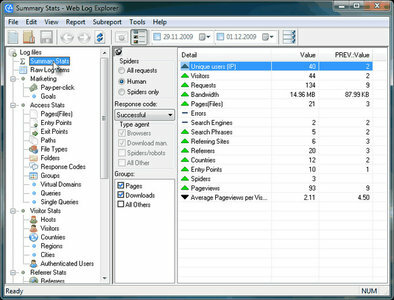 Web Log Explorer is the fastest and most powerful an interactive, desktop-based log analyser for Windows. This log analyzer create "multilevel" and cross-linked reports on-the-fly. It allows you to dig as deep into your data as you need to. Simply right-click a row in any report, whether it's a page, a host, a user, a search engine or anything else and choose from a list of sub-reports available for this report item(s).